EA's the one you want to talk to, says Zampella. If you've been following Titanfall, then you know that the giant mecha shoot-em-up is a Microsoft exclusive, for PC, Xbox 360 and Xbox One. No, that isn't a six-month-only deal; it's in perpetuity, which many have taken to mean is Microsoft's way of making sure rival Sony didn't get its mitts on what Microsoft sees as a flagship title. But it takes two to make a dream so real, the publisher and the developer, and Respawn Entertainment's Vince Zampella has taken to Twitter to point the finger at the villain of the piece: EA. "Always exclusive at launch," Tweets Zampella, "great partner and focus is good for a startup. EA made a deal for the rest, we only found out recently. =(" Zampella also confirmed that the deal was only good for the first game, implying that future falling Titans, or whatever else Respawn chooses to make, might be found on Sony's console. Zampella went on to imply that, in his view, longevity of the Titanfall franchise was harmed by not having it on PS4. As far as Zampella's concerned, Respawn's main focus right now is to make sure Titanfall is the very best it can be, and any distractions are being ignored. 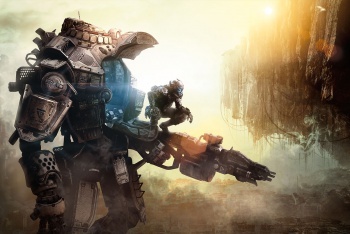 Titanfall's due March 2014, and you don't need me to tell you what platforms it's appearing on.